I've attempted flicking the shuffle options in settings, lists, but to no avail. Is this how "Shuffle songs" should be now, or indeed a bug? 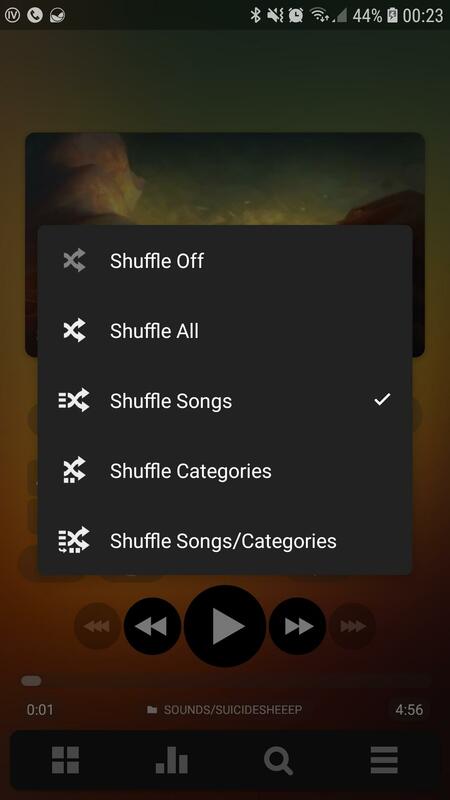 First, choose the folder you want to play from and tap on the first song you want to hear to start playback. Then (if this is not already set) tap on the Shuffle icon on the Player screen (right-hand side, under the cover artwork) to cycle through the various options. The first one is 'Shuffle All Songs', which would appear to be what you have currently got enabled. The one you want is 'Shuffle Just Songs'. 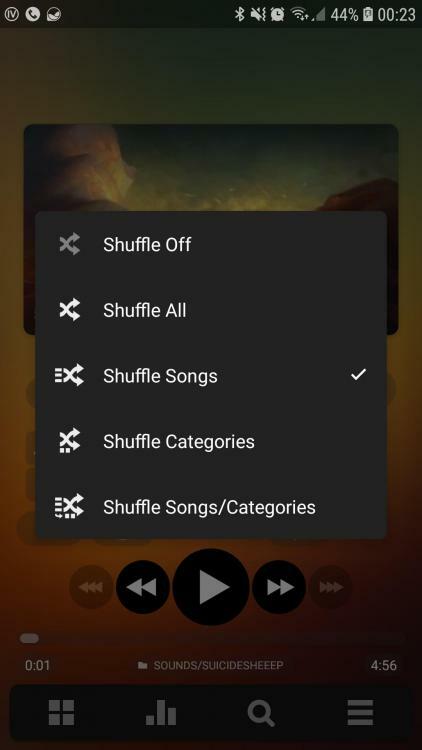 That will shuffle the songs in the current folder only, and only then move on to the next folder in order and shuffle all of its songs, and so on. If you want to stop after the current folder has finished, set the Repeat icon (to the left of the Shuffle icon) to 'Repeat Off' rather than 'Advance List'. Thanks for the response, much appreciated. My concern stemmed from having the shuffle just songs (attached) selected, but it crossing into other folders as though shuffling all songs. However, you're right. I was just confused by the layout... after going back into folders & entering the one intended, it's working as expected. Thanks for the help! Here's the problem. When searching using the magnifying glass, it resets the folder to be every folder. Is there anyway to disable that? Is that the intended functionality? If it is, fair enough... just a hassle now to search for a song within a folder as I'll need to navigate through several menus. Yes, Search will do that. It needs to, as it could be playing material from anywhere.